My, what a big gift you have little mouse. He is working with all his might to open the ribbon. 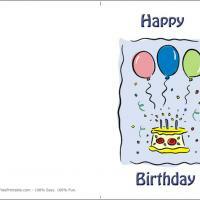 You will not have to work that hard to send the best birthday wishes ever with our free printable birthday cards. They are simple to use for all your card needs with our easy to use custom print feature. You can add images and personal messages. The card Mickey Gives Gift has a large purple birthday present complete with a big matching bow. The lettering is a bright fun red. An inside message conveys hope that wishes come true. You still have room for a personal message printed also. That is one huge present for this cute little mouse to handle! I wonder to whom he is sending this huge gift? Well, if you're sending these printable birthday cards to make someone's special day even more special, this is probably their present as well! These free printable cards are perfect for kids who will love the little mouse on the cover. 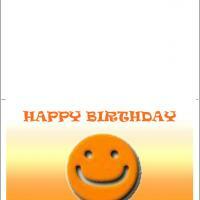 It can be used both as a card you give to your child or a card they can share with a friend. 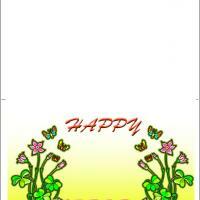 Either way, feel free in adding your own embellishments to turn this card into a work of art. Surely all those who receive it will appreciate this little mouse's hard work! We are working as hard as this cute little mouse is to make sure you are getting the best free printable cards. 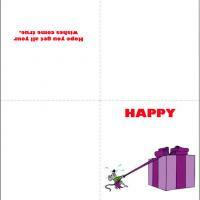 Our cards have plenty to choose for boys, girls, or older loved ones. 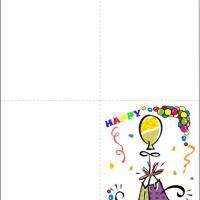 Each card is eligible for added images and custom printed personal messages without the wait. Just select a card and you will be guided on what to do next. Then, you will print all you need right at home. Mickey Gives a Gift is presented in a dark and light purple color scheme. Also, large easy-to-read red letters to wish happy birthday and wishes do come true. Find out how many you can print today.